I decided to invest some time in improving the shoulder fit on this tunic since it's a really simple pattern that could be easily adapted to create other styles. So I consulted Fitting & Pattern Alteration: A Multi-Method Approach by Liechty, Pottberg and Rasband. I picked this up after I heard Susan Khalje mention that it is her favorite fit book. I haven't used it much yet, but so far I like it's technical, no frills approach to analysis and correction of fit issues. Each fit issue is addressed on a 2-page spread, and the chapters are broken out by body area - hip, torso, neck - which makes it efficient to flip through looking for your particular issue. They give you line drawings of "the wrinkles" that we love to analyze, and a text description of the underlying structural reason for them. Then they describe how to resolve the issue on a fitting garment and on the flat pattern pieces. I get lost reading the text, but the pictures are understandable for the most part. Here's my altered back bodice piece where I cut open the back in a few places so I could move the shoulder seam forward by half an inch. Extra fabric is added to the back to accommodate the fact that the armscye is moved forward. Here's my altered front bodice. You can't really see the forward shoulder adjustment since I just chopped off a piece of the pattern at the shoulder seam and carved out a bit at the armhole. You can, though, see how I pinched some fabric out at the neckline, tapering to nothing at the hem. I did this because I found there was a bit of extra fabric at the neckline on my muslin (possibly related to my forward shoulders?). Now, the sleeve pattern piece. The F&PA book shows how to alter a sleeve for a forward shoulder adjustment, but I just don't get it... Then I found this tip on Pattern Review which sounded simple enough, so I used that method (literally, slashing the piece horizontally underneath the sleeve notches, moving the cap forward the necessary amount, and redrawing/truing the seamlines) to start with. I muslined that sleeve piece and found two issues, (1) I didn't like how much ease was in the sleeve cap (1.5") and (2) the angle of the sleeve felt very restrictive - it was fine with my arms by my side but tight when I raised them. The sleeve cap was 5.5" at this point (versus it's original height of 6"). My recent epiphany on how sleeve angle relates to sleeve cap height (thanks to David Page Coffin's Shirtmaking book) is still fresh in my mind, so I decided to lower the sleeve cap height by 0.5", thereby giving my arm a bit more freedom to move. (And yes, if you followed the epiphany link, I still need to finish that shirt for Tim; I'm too selfish with my time to sew for others.) In the picture above, you can see my new pattern piece with shorter sleeve cap height laid on top of the previous sleeve pattern piece. Note that the sleeve is wider now. When you remove sleeve cap height, you are really just redistributing the armhole seam by giving yourself more width in the arm (the length of the armhole stitching line is unchanged so no adjustment is necessary to the bodice!). This is exactly what I wanting for this tunic - a slightly looser, more flowy sleeve. Very interesting. I do forward shoulder alterations all the time, but I have never seen this method. usually I just adjust the slope of the shoulder seam on the bodice. It looks like your method adds a bit more room at the back and a little less at the front, which is what I need. For the sleeve, i have developed my own method, which I have not seen anywhere else (I usually do a 1.5 cm forward shoulder, combined with a 1 cm square shoulder and then add a narrow chest alteration). I pick a pivot point, often somewhere around the bicep mark....I slash from the pivot point to either side of the shoulder cap (about where the curve changes from concave to convex) and then rotate the shoulder cap forward (in my case, by 1.5 cm) and then blend the seam lines. I figure that since my shoulder is rotated forward, it makes sense to rotate the sleeve cap forward. Oy. I so need to do this. I am also glad you reviewed this book after I got my copy! In the first sleeve cap photo, is that before the fwd adjustment? If so, how do you think the fit changes with moving the shoulder fwd? I do a forward shoulder adjustment and I don't usually touch the sleeve. The dot just moves the sleeve forward with the adjustment. I do a much simpler adjustment than that by adding to the back and cutting off the front the same amount at the shoulder seam and blending back to the neck. I have tried several methods and the simplest one works the best for me. I do have this book and I agree I get lost in the technical stuff at the beginning. 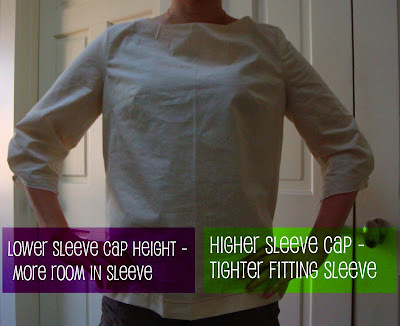 Your sleeve alteration makes a big difference. I most always remove sleeve cap ease. For whatever reason, commercial patterns have a lot of ease into the cap. Thanks so much for all the info. I have just got the David Coffin book so I really appreciate the references to it. The sleeve cap info is super interesting- it is a difficult concept - you take it down and you get more ease of movement... huh! I look forward to seeing the finished top! Excellent review of your process.Thank you. I am going to review your steps more closely. As for me, I am still in the denial stage-I don't "need" to make an adjustment like this.......... yeh right. I am new to fitting, and have been reading Fit For Real People. 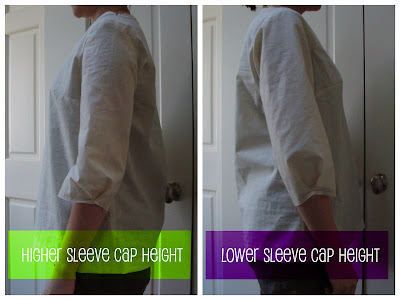 It has a pretty simple forward-shoulder adjustment method that includes sleeve adjustment. It sounds very similar to some of the others that commented earlier. I also need to do this adjustment, so I will try this method first. Please bring this pattern and muslin to our next meetup! I really, really need to get a grip on understanding fit with relation to me. That's a phase of my sewing I think I'll concentrate on next. Thanks for this info. Love your blog. I am waiting for my subscription to Burda World of Fashion to come in so I can try my hand at these Burda patterns. So excited. I am adding you to my blog list. This had me fascinated - I've yet to even work out if I need a forward shoulder alteration but when I do, I know I'll be coming back to this post quick smart! I'm about to delve into making my first coat so will find out very soon about all the 'alterations' that will become a staple part of my pattern-diet. you people are killing me. Fit For Real People. Do a forward shoulder and broad back adjustment in about 60 seconds flat. and yes they take the sleeve into account as well. enjoy your blog...learning how to sew clothes. i just found out i have a forward shoulder (from the dr.). went in with neck pain. there are excercises to correct. apparently it gets worse with age. caused from the front torso muscles being stronger than the back muscles, the head juts forward. common with people who sat at a computer all day or heavy breasted women. Ah. Thanks for this. I don't understand half the post because I'm a beginner, but it is ringing loud bells - I am working with McCalls 5522 and having immense problems with the sleeve. A friend who makes patterns slashed it, added seam allowance to the circumference of the sleeve to accommodate my bigger biceps (from hoisting a toddler), and reduced the sleeve cap. It's still not great - I think the armhole is too big or low, but it's a lot better than it was. I wil go through your post more slowly and especially investigate the links. thank you! Excellent post, thanks for sharing your process!